Spike Jonze Directs Mischief, 'Wild Things' The director of Being John Malkovich and Adaptation discusses his new film, Where the Wild Things Are, adapted from Maurice Sendak's classic children's book of the same name. Director Spike Jonze and actor Max Records pause on the set of Where The Wild Things Are. When children's book author Maurice Sendak asked his friend, director Spike Jonze, to make a film based on his book Where the Wild Things Are, Jonze initially declined. The book, which tells the story of a mischievous boy named Max who is sent to bed without supper and winds up visiting an island inhabited by big-eyed monsters, is heavy on illustration and light on dialogue — not exactly a perfect recipe for a screenplay. But Jonze tells Terry Gross that as he thought more about the project, he began to get inspired. "I started to try and just go inside the book as opposed to thinking of stuff I'd put on top of the book," says Jonze. "In thinking about who the wild things were ... I started to think of them as wild emotions. That idea seemed like a big one." 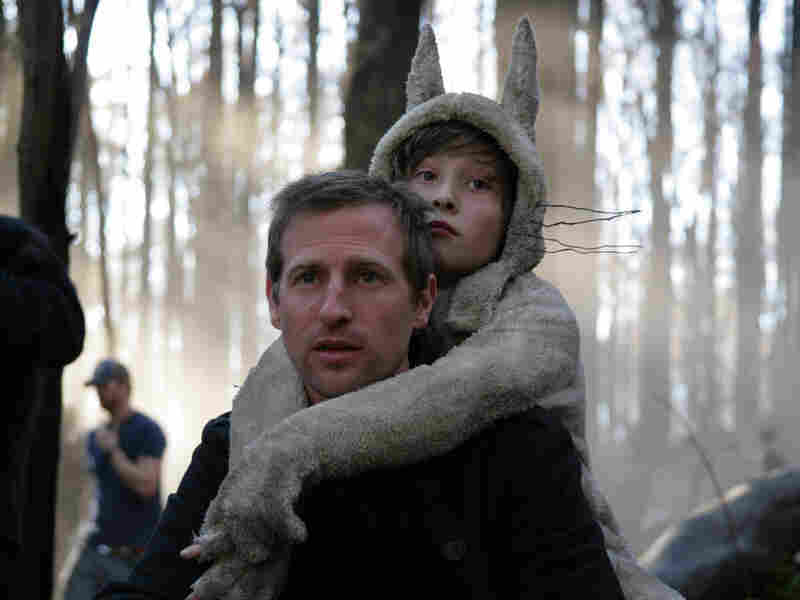 Though he could have created the film as an animated feature, Jonze says "it just felt right" to make it as live action movie, complete with a real location and an actual child actor (named Max Records) playing Max. The director says that he and co-writer Dave Eggers agreed that live action would help the audience take Max's character — and the world of the wild things — seriously. Jonze took special care in casting the actors who played the wild things. "What we were looking for was really internal subtle performances," he says. "When I read the book and I imagined being Max, I didn't imagine being Max inside some animated version," says Jonze. "We wanted a real kid ... [going] to a real place with these creatures that are there in front of him that can push him, hug him and pat him on the head and with their claws sort of swiping close to his face." Sendak's wild things are frightening and fantastical giant creatures with strangely human characteristics. For the movie, Jonze commissioned 10-foot-high versions of the monsters from Jim Henson's Creature Shop and then set about carefully casting the actors who would wear the costumes. "What we were looking for was really internal subtle performances. My dream was that when you put the camera on a wild thing it would be the same as putting the camera on Meryl Streep or Nicolas Cage or James Gandolfini. You'd be able to just sit there, have the camera rest on their face as they're listening or not even talking, just listening," he explains. Ultimately, Jonze's casting efforts paid off — at least when it came to Sendak's approval. The director says he was with the author the first time Sendak saw the film: "And when the lights came up, he gave me a big hug and was really proud of me and proud of the movie and, you know, above and beyond anything that was — that's the approval that I value the most."